The premium coupé market will see a new four-ringed contender enter the ring with the new Audi A5, which finally makes its way to Malaysia. The second-generation model is being previewed in showrooms in five-door Sportback form, offering plenty of swish for your cash. 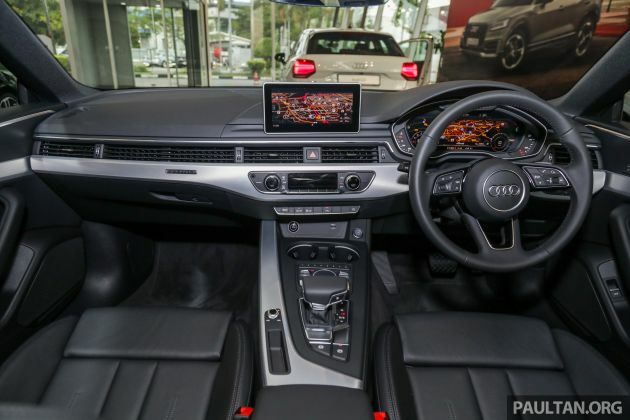 Available in a sole sport 2.0 TFSI quattro trim, the fully imported A5 Sportback will retail at RM339,900 on-the-road without insurance, together with a five-year, unlimited-mileage warranty. By comparison, the BMW 430i Coupé and Mercedes-Benz C 300 Coupé, both two-door only, are priced beyond the RM400k mark, although they both come in the desirable M Sport and AMG Line trims respectively. On the outside, this new model is still recognisably an A5, retaining the svelte roofline and wavy shoulder line of the Satoshi Wada-penned original. It’s been modernised somewhat, with a flatter “singleframe” grille, trapezoidal head- and tail lights and a clamshell bonnet with twin strakes. Full-LED headlights with two-pronged daytime running lights come as standard, along with 19-inch multi-spoke alloy wheels. Inside, the A5 gets the same full-width air vent design as the B9 A4, plus the full suite of Audi’s latest technologies. These include the 12.3-inch Audi virtual cockpit digital instrument display as well as the MMI navigation plus infotainment system – the latter adds an 8.3-inch freestanding screen and the MMI touch rotary controller ahead of the gearlever. The interior is dressed in leather and leatherette upholstery with Silver Aluminium Ellipse trim and black fabric headlining. Other standard features include keyless entry, push-button start, triple-zone automatic climate control, power-adjustable sports seats with driver’s side memory, adaptive dampers, a 10-speaker, 180-watt sound system, a reverse camera and a powered tailgate. No autonomous emergency braking, unfortunately. Power comes from a 2.0 litre turbocharged four-cylinder petrol engine that produces 252 hp at 5,000 to 6,000 rpm and 370 Nm of torque from 1,600 to 4,500 rpm, paired to a seven-speed S tronic dual-clutch transmission and quattro permanent all-wheel drive. 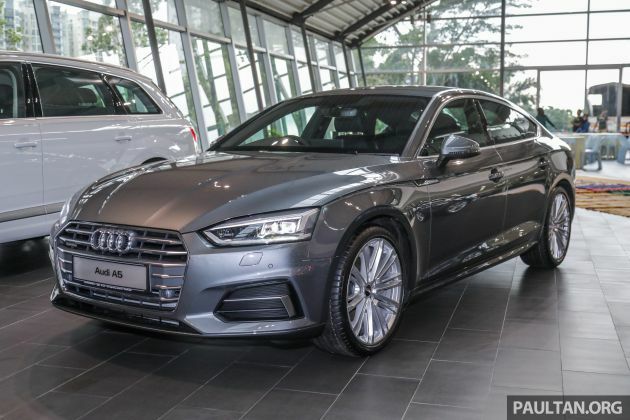 The post F5 Audi A5 Sportback sport 2.0 TFSI quattro previewed in Malaysia – 252 hp, 370 Nm, priced at RM339,900 appeared first on Paul Tan's Automotive News. 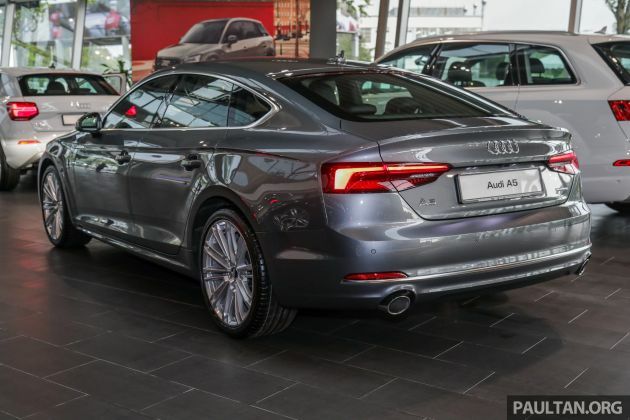 0 Response to "F5 Audi A5 Sportback sport 2.0 TFSI quattro previewed in Malaysia – 252 hp, 370 Nm, priced at RM339,900"